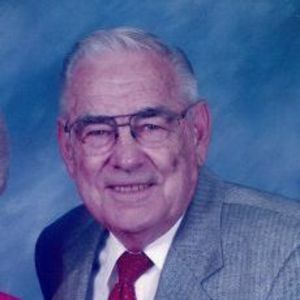 Merle C. Mueller, 94, of Sun City, Texas passed away on Thursday, January 3rd. After he graduated from Thomas Jefferson High School in San Antonio, he attended the University of Texas, Austin, graduating with a Bachelors in Aeronautical Engineering with a Naval Reserve Commission. After his military service he was employed with Luscombe Airplane Company in Garland, then Temco (subsequently acquired by LTV). He retired from E-Systems in 1979, having served as Vice President. He met and fell in love with Wanda Stover. They married in 1948. Their son, Gary, was born in 1951 and was tragically killed in an auto accident in 1971, a devastating loss to both of them. After retirement, he and Wanda enjoyed traveling, gardening and raising longhorn cattle on their small property in Rowlett. He and Wanda loved the hill country and finally found and moved to the location of their dreams in Sun City in 1996. They were greatly dedicated to their community through their involvement in the Nature Club, the Garland Club, COPS and volunteered many years at the Baylor Scott & White Hospital in Round Rock. Merle helped plan and design The Worship Place in Sun City and they were active members until his death. He was preceded in death by his parents, Rheinhardt and Edith Vollmer Mueller of San Antonio, his wife Wanda and their son, Gary. He is survived by his brother, Rudy and his wife, JoAnn Bradley Mueller of Dallas, two nieces, one nephew and their families. Contributions may be made to the American Cancer Society or other charity of your choice. There will be a Memorial Service at The Worship Place in Sun City, Texas on Sunday, February 3, 2019 at 2:00 pm. We will always remember Merle. He was a very kind and a real gentleman. We will miss him and feel he is happy to be with his Lord and wonderful wife, the love of his life. I will always remember a kind and gentle man that I sat by in church. I will miss him but happy he has gone to be with the Lord and his wonderful wife, the love of his life. May God who understands your sorrow comfort and strengthen you during this difficult time. A wonderful man and a good friend. He will be missed by all who knew him.